Policy Note: Energy for the future: Insights from the case study in Jordan (MENA SELECT Policy Note). 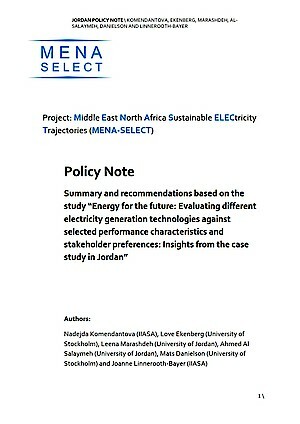 The goal of this research was to understand the visions and views of different groups of stakeholders on different electricity-generation technologies currently considered in Jordan. A total of nine electricity-generation technologies were evaluated (concentrated solar power, large-scale PV, wind, large-scale hydro, oil, oil shale, gas, coal and nuclear). The technologies were evaluated against a set of eleven criteria, which were developed and discussed in consultations with stakeholders. \ Create a favourable environment for investment in renewable energy sources. \ Provide further opportunities for participation in decision-making processes on energy transition. \ Create conditions for an energy transition that is socially, environmentally and economically sustainable.